Our housecats often long to go outside when the spring weather comes, some staring on the windowsill, others trying their best to perform a jailbreak. If you have are considering allowing your cat a little more freedom by letting them venture outdoors, there are some things that every pet owner needs to be aware of, from the hazards awaiting your housecat to the habits and hitch-hikers they can bring inside. 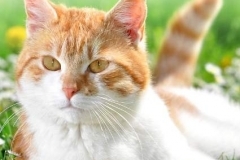 Outdoor cats are at an increased risk for flea parasite infestation due to their exposure to the uncontrolled environment and other potentially infested animals. Parasites can transmit disease to your pet if your cat is not protected by a flea & parasite control regimen from your veterinarian. Additionally, outdoor pet cats need to be vaccinated against diseases that are common to the local area to protect their health and help prevent the spread of the disease. For more potential pet poisons that are waiting outdoors for your cat and so you can plan your pet-friendly garden, check out the Pet Poison Helpline or talk to your veterinarian. A domesticated cat can end up in territorial battles with other cats in the area, come across an aggressive dog, or be seen as prey to potential predators. It is important to check your cat when it returns to the house to ensure that there are no cuts, scrapes or other signs of a battle as these can become infected if left untreated. Additionally, there is always the potential that your cat could contribute to the wild cat population or bring a litter home if they are unspayed or unneutered. You cat may win the odd territorial battle against other local rivals, but they won’t win a confrontation with a car. This can be a particularly significant problem if you live in a busy neighborhood or along a highway with fast-moving traffic (including the countryside). If you live in a high-traffic area, consider striking up a walking routine with your cat on a leash and harness to give them outdoor exercise and fresh air. You and your neighbours may be quite proud of your garden, but the beautifully cultivated flora can be undermined by the presence of outdoor cats. Used to using a litter box for their waste, your cat may decide that your rose bed is the perfect place to hide their mess. Such befouling of one’s gardens can be very frustrating and taxing on neighbour-to-neighbour relations. Many outdoor cats love to return to their stalking and hunting roots. Some may swallow their prey and no one is the wiser, but others return their kill to the home to share with their owners first. It can be endearing in a way, but it can still be quite unpleasant to have dead vermin brought indoors. Want to help give the mice and birds a fighting chance at a get-away and reduce the body count on your doorstep? Placing a small bell on your cat’s collar can work wonders. Cats, just like dogs, can get lost and not be able to find their way home. This can sometimes mean their adoption by someone else who is able to help the lost pet, or their pick-up by the Society for Prevention of Cruelty to Animals (SPCA). If you have a cat that ventures outdoors, ensure that they wear their collar and identification tag at all times, and also visit your veterinarian to have them microchipped. It can be very difficult in some cases to keep a determined cat from going outside but if just can’t convince them to stay inside, it is essential to be knowledgeable of what’s waiting for them on the other side of the door. For more information on how to keep your cat safe when outside, make an appointment to visit your veterinarian today.